Eight black leaders will be honored for their contributions on behalf of America’s more than 3 million public charter school students at a Thursday evening reception in Washington, D.C. 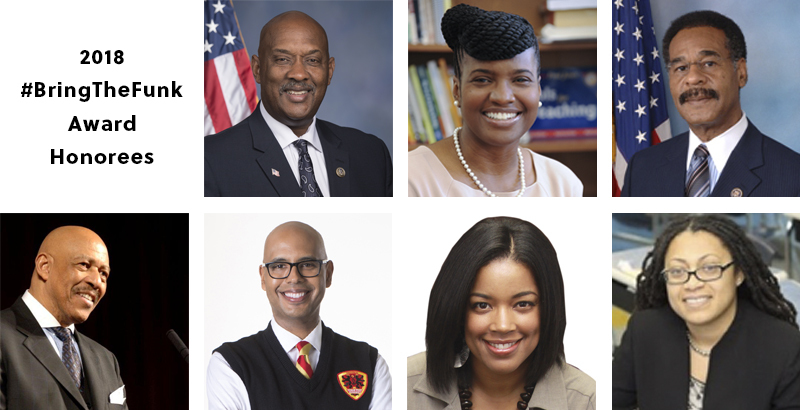 The event is being held in conjunction with the Congressional Black Caucus Foundation’s 48th Annual Legislative Conference, and among the honorees are three caucus members. 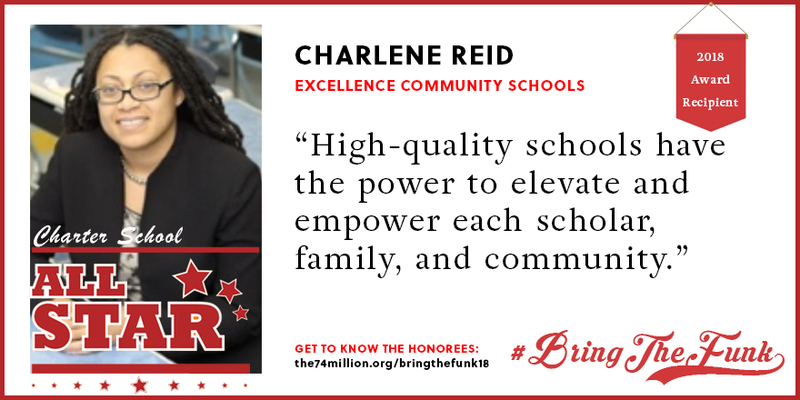 The 2018 #BringTheFunk awards are sponsored by 100 Black Men of America, Inc., of Washington D.C. and Prince George’s County, Education Reform Now, the National Alliance for Public Charter Schools, and the Walton Family Foundation. The ceremony is being hosted by broadcaster Roland Martin; The 74 is a media sponsor for the event. 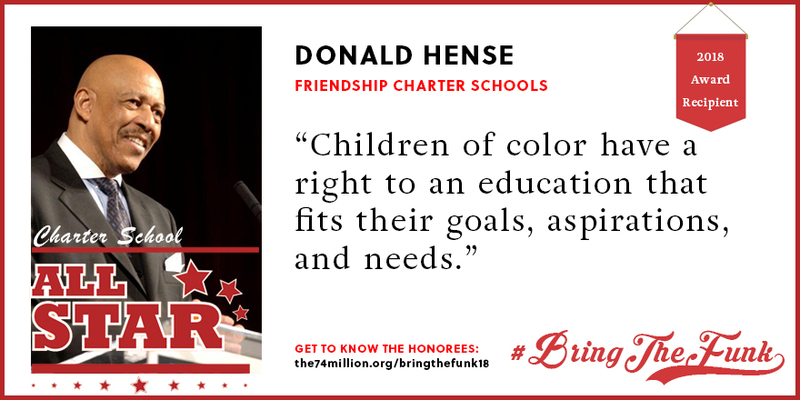 Donald Hense is the founder and chairman of the board of Friendship Charter Schools, the largest group of public school charters in the nation’s capital, serving more than 4,200 students on 11 campuses. Why do you think improving the quality of education is important to our country? Hense: American dominance in the global economy is being challenged worldwide. Our country lacks a cohesive strategy to better educate our children to compete in the global economy. Why do you believe school choice is important for communities of color? Children of color have a right to an education that fits their goals and aspirations as well as their needs. This cannot be done in a one-size-fits-all educational system. What has been your biggest education accomplishment thus far? What are you most proud of? I am most proud that we started our schools with the goal of improving the graduation of low-income children from high school. Since our first class, we have averaged a graduation rate that exceeds 90 percent. Which African-American leader inspires you in your education crusade, and why? I am a graduate of Morehouse College. I went to Morehouse because Martin Luther King Jr. was a graduate. I have tried to live up to his dream by giving back to my community in meaningful ways. Work hard to achieve your dreams — your life only happens once. 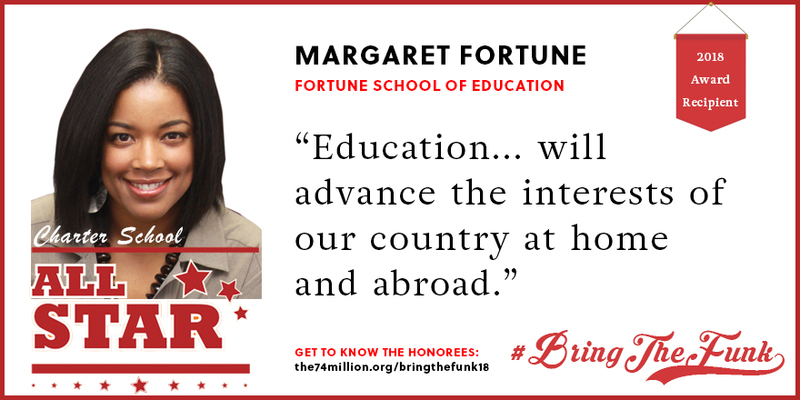 Margaret Fortune is president and CEO of Fortune School, a network of K-12 public charter schools in Sacramento and San Bernardino counties with a mission to close the African-American achievement gap. The California network currently encompasses seven public charter schools with a combined enrollment of more than 1,700 students. Fortune: Educating the American people to a level of excellence is the most important thing we can do to advance the interests of our country at home and abroad. More than anybody, communities of color need all the choices they can avail themselves of a high-quality education. It’s about equity and social justice for people who have been systematically underserved by American schools throughout history. School choice offers opportunity for many families who see college graduation as the destination for their children. I have founded seven schools in the past 10 years, serving over 1,700 students all focused on closing the African-American achievement gap in my hometown of Sacramento. Last spring, Cal Poly San Luis Obispo (California Polytechnic State University) awarded me an honorary doctorate in recognition of my work with African-American children. My advocacy in the state of California resulted in $300 million in new funding in the 2018 Budget Act that will benefit 146,000 low-performing public school students. I love Harriet Tubman. Her courage in liberating black people from slavery inspires me to provide a path for black families who seek liberty within the American education experience. Tim King is founder, president, and CEO of Urban Prep Academies, a nonprofit organization operating a network of public college-prep boys’ schools in Chicago (including the nation’s first all-male charter high school) and related programs aimed at promoting college success. One hundred percent of Urban Prep graduates — all African-American males and mostly from low-income families — have been admitted to four-year colleges or universities. King: Improving the quality of education in our country is critical because education is the most accessible conduit to improving the quality of life for the most in-need members of society. 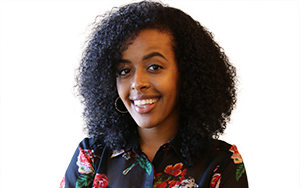 Many times the neighborhood schools students of color have access to are experiencing a variety of challenges: understaffing, lack of resources, dilapidated facilities, etc., so the option to be able to attend schools that cater to their needs, are designed specifically for them, and have adequate resources is imperative. Without question it has to be starting Urban Prep with the group of African-American education, civic, and business leaders that helped found the organization and our schools. I’m incredibly proud of the work we’ve done as the nation’s first network of all-boys, public charter high schools and the success we’ve attained as 100 percent of our graduates — all black males — have been accepted to four-year colleges and universities. So many! First and foremost, my parents, who have demonstrated an incredible amount of leadership through their commitment to improve the lives of black folks. But the most widely known individual whose leadership has inspired me would have to be Howard Fuller. He’s just amazing. Give back; your responsibility lies not just with yourself, it is your responsibility to make your family, your community, and the world. 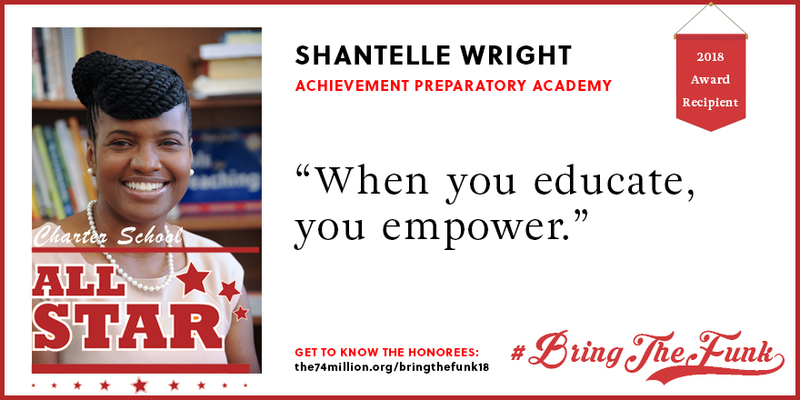 Shantelle Wright founded Achievement Prep in 2007 as a Building Excellent Schools fellow and has led the school to be one of the top-performing schools in D.C. since its inception. She has received numerous awards and recognitions for her work in urban education. Wright: When you educate, you empower. Opportunity and choice should not be limited to those with access. Unfortunately, in our country, communities of color are often plagued with improper or insufficient resources, including, but not limited to, school choices. This insufficiency then results in a continued cycle of poverty and despair, forced, by default, to live with the choices. I am most proud of the impact we have made, through our schools, in the community we serve. We are intentionally and strategically located in Southeast D.C., where historically access has been limited and/or subpar. Achievement Prep is part of our community. We believe that when you educate a community, you empower a community. We invest in our community, not just by educating scholars, who will then come back and lead thriving communities, but by being part of the change we want to see in the community through investment in our families (education, advocacy, etc. ), community service, and financial investment in what was a dilapidated part of the city through $33 million investment in state-of-the-art facilities. This community impact makes me most proud. I know this sounds cliché, but I have to say Barack Obama. He defied the odds — in a country where racism is in its DNA, he, a black man, rose to hold the most powerful position in our country. Twice. And he accomplished this not because he was necessarily smarter than anyone else or had access to the best, but because he received a top-notch education that empowered him. That inspires me. Every day, it reminds me that in my schools, in my classroom could be the next president of the United States because I saw it come to fruition in my lifetime. That inspires me to keep on going. What we tell our scholars daily — there’s no one better than you. No matter the color of their skin, how much money they have, what kind of car they drive, or how big their house is. There’s no one better than you. If you want something, put your mind to it, go get it — period! 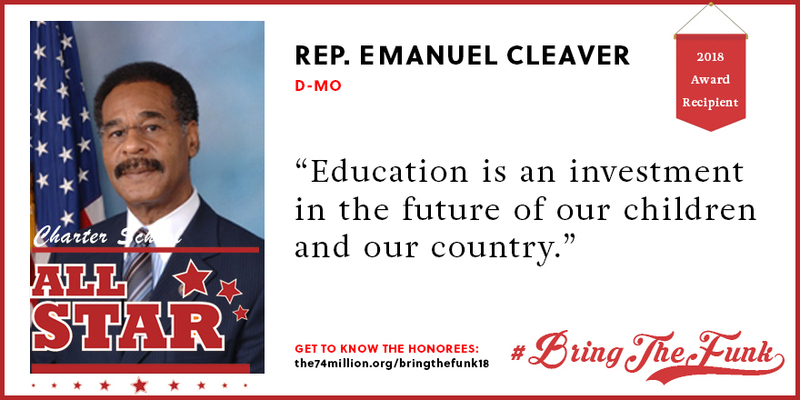 Congressman Emanuel Cleaver II serves as a pragmatic voice for supporting investment in innovation for the 21st century, advancing a world-class education system, and empowering hard-working families. Having served for 12 years on the City Council of Missouri’s largest municipality, Kansas City, Cleaver was elected as the city’s first African-American mayor in 1991. He is a member of the House Financial Services Committee, the ranking member of the Subcommittee on Housing and Insurance, and also a senior whip of the Democratic Caucus. During the 112th Congress, Cleaver was unanimously elected the 20th chair of the Congressional Black Caucus. 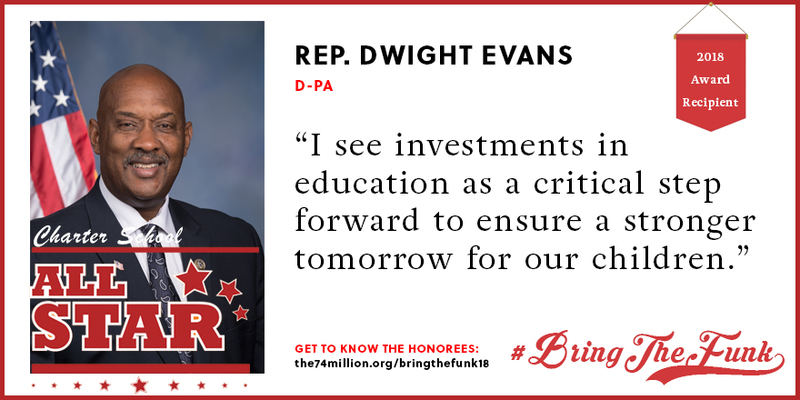 Congressman Dwight Evans has dedicated his life to the cause of urban renewal, working tirelessly to provide economic and educational opportunity to those who too often live in the shadows, the poor and underserved. Over the course of 36 years in the Pennsylvania Legislature, Evans earned a reputation as a pragmatic leader who knows how to put public policy above politics. Evans is also the founder of the West Oak Lane Charter School in Philadelphia, the first unionized charter in the state of Pennsylvania. Congressman Hakeem Jeffries represents the Eighth Congressional District of New York, an area that encompasses large parts of Brooklyn and a section of Queens. In Congress, Jeffries has emerged as a relentless advocate for social and economic justice. He has also has been a longtime supporter of quality, nonprofit public charter schools in New York. As an outspoken critic of one-size-fits-all education, Jeffries has embraced innovations that led to the educational outcomes of college matriculation and career readiness for families in his district. Disclosure: The Walton Family Foundation provides financial support to the National Alliance for Public Charter Schools, Education Reform Now, and The 74.